I want to start with another reminder. Games start this evening at 8:30PM so I hope that this article is not too late for those of you who like to see the KFC team. The transfer deadline is 8:15PM, so don’t forget to make your trades. 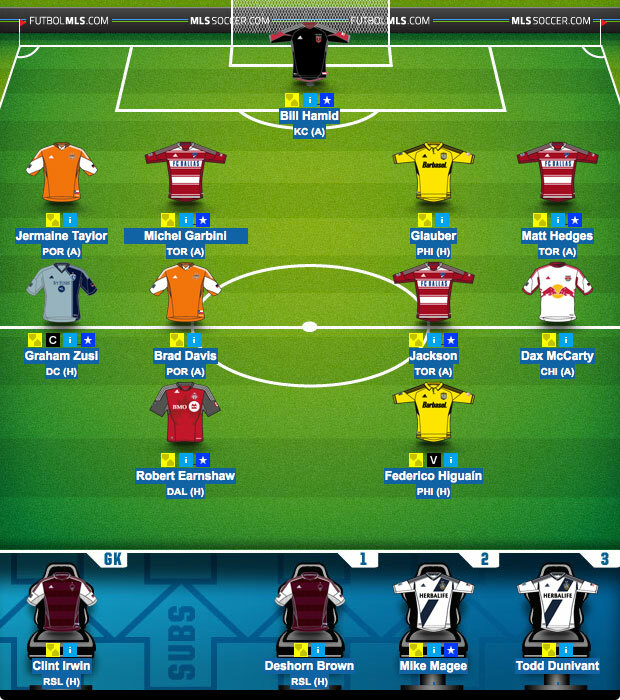 And now, our fantasy MLS week 6 team. Overall, we were very pleased with the result of our team. The biggest letdown was the LA game, and I’m sure many of you all agree. I’m not sure what happened but there was a clear breakdown and it lead to a goal for Toronto and a -8 point hit to out team. This is the rink that you run when you double up on defensive players, you just have to balance that risk with reward. Captain Zusi paid off big for us, and we were also very happy the performances from Davis and Earnshaw. Having 5 teams on a bye this week did make choices a little hard, but fortunately, we knew that was coming and were able to plan a bit for it (mostly by not grabbing too many Montreal players). Fortunately, we had the extra trade that MLS Fantasy gave to everyone. This trade helped us to free up some extra cash and do a little prep for the double game week coming up. Our first trade happened early, we dropped Kwame Watson and replaced him with Michel Garbini Pereira. I get a little nervous to have 2 Dallas defenders (especially after what happened to LA), but overall, we decided that Michael was clearly going to be gaining a lot of value this week and that the Toronto game had a good chance of going in Dallas’s favor. Hedges and Michael are also very good bonus point generators. The 2nd and 3rd trade we made two goals. 1) Clear out our 1, underperforming, Montreal player, and 2) do a little prep for the double game week. To accomplish the second goal, we wanted to bring in a New York player. Buy grabbing a midfielder we would kill 2 birds with one stone. But first we needed some cash. There was an obvious choice Clint Irwin. We dropped Cudicini and replaced him with the cheapest starting keeper in the league. We still believe his value is going to go up and with Hamid being out starting Keeper for the next few games, it was an easy choice. With the extra money, we dropped Davy Arnaud and replaced him with Dax McCarty. This gives us New York coverage from a player who is neither in poor form or injured. We think other people will notice this and that Dax’s value will rise as the week 8 double games gets closer. Our bench is easy this week. Both of our Colorado players are on the bench and our two remaining LA players. Again, not a hard choice, Zusi. The most important detail to note about week 7 is that Sporting Kansas City does not have a game. We’re happy that we only have to worry about Zusi for this week. We can easily replace him with one of our LA players and still field a full XI. The plan right now it to make one trade and save the other for getting a good team ready for week 8. So that’s the KFC team for Week 6. What do you think? How did your team do? Want input on your team? Stop by r/FantasyMLS and post. There are many good members who can help out with questions.